This is a resource for professionals on all sides of Environmental Due Diligence. It’s practical handbook with examples to assist in gaining knowledge and skills needed to perform/review an assessment. 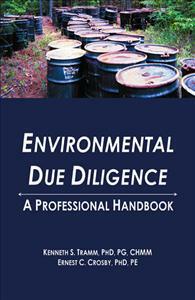 This is a resource for professionals on all sides of Environmental Due Diligence. It’s a practical handbook with examples to assist in gaining knowledge and skills needed to perform/review an assessment. Long overdue, this text pulls together all the relavent materials I need on a daily basis and helps me train junior staff for this field. This is a great reference for environmental professionals in other practice areas having little or no subsurface soil or groundwater monitoring experience who need a basic knowledge of Phase I, Phase II, and Phase III due diligence.